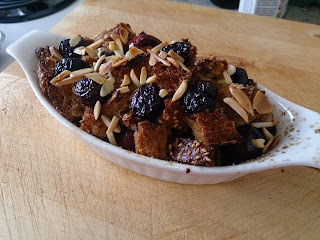 Cherry almond baked French toast Simply Filling + 1pp or 7pp all depends on the bread you use. Mix the egg, milk, vanilla extract and sweetener together then pour over the bread cubes. Toss carefully to wet all the cubes. Add the cherries saving a few to put on top. Pour the bread mixture in. Top with a couple of the cherries, the almonds and lastly the sugar. 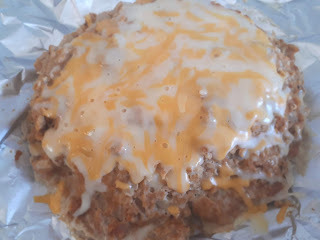 I baked mine in my toaster oven at 375 for 20-25 minutes or until browned.